There isn’t much that is more comforting when you are sick or feeling rundown than a steaming bowl of chicken noodle soup. Enjoying this comfort food from stock you have made yourself adds another layer of healing to this wonderful dish. For thousands of years people have been curing themselves with the power of bone broths and now you, too, can add this wonderful medicine to your list of cures. Keep a plastic bag in your freezer and when you have vegetable scraps like carrot ends, onion skins or celery tops freeze them until it’s time to make broth. Then you won’t have to use whole carrots or onions in your broth, you can use what might’ve been composted or discarded for a good purpose. After cooling the broth pour it into ice cube trays especially for this purpose and freeze. When the cubes have frozen put them in a storage container in the freezer. When you need a cup of broth pop out 6 or so cubes and defrost on the counter or add right to your pot on the stovetop. 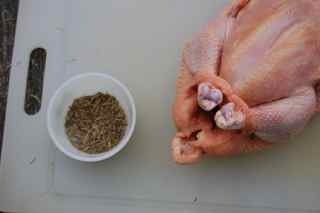 Here’s how we make chicken broth in our farm kitchen. 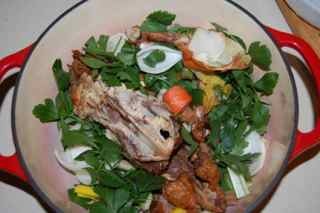 • Save the leftover bones from the whole chicken or chicken parts after you’ve picked the carcass of the meaty bits left behind. Or, use 4-6 chicken backbones. For added flavor and depth roast the backbones in a 350 degree oven for 45 minutes before adding to your broth pot. 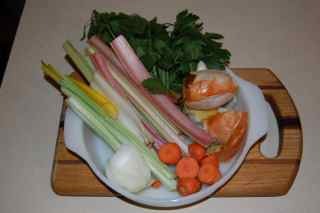 • Add the bones and carcass with whatever skin, fat and spices are remaining to a stock pot. To the pot add any vegetables you’d like. Give them a rough chop first in pieces about 2-4 inches in size. We always use onions, celery, celery leaves and carrot. Pepper cores, onion skins, broccoli stalks, kale and chard ribs, and green bean tips are other populars in our stock pot. • Cover the bones and vegetables with cold water and add a few tablespoons apple cider vinegar. Let this sit for about 30 minutes. The apple cider vinegar will help leach the vitamins and minerals from the bones prior to cooking. • Add fresh herbs like thyme, parsley, or sage to the pot and bring the pot to a boil. Skim any white bubbles from the stock and discard. • Lower the temperature, cover the pot and gently simmer for at least 12 hours, but as many as 36 is good. • Let the pot cool, then strain the broth into glass jars and store in the refrigerator or put into freezer containers and freeze. Your broth will most like form a layer of gel on top. This is good stuff- minerals, gelatin, and calcium. Combine the salt, pepper and Herbes de Provence in a small dish. Mix well. 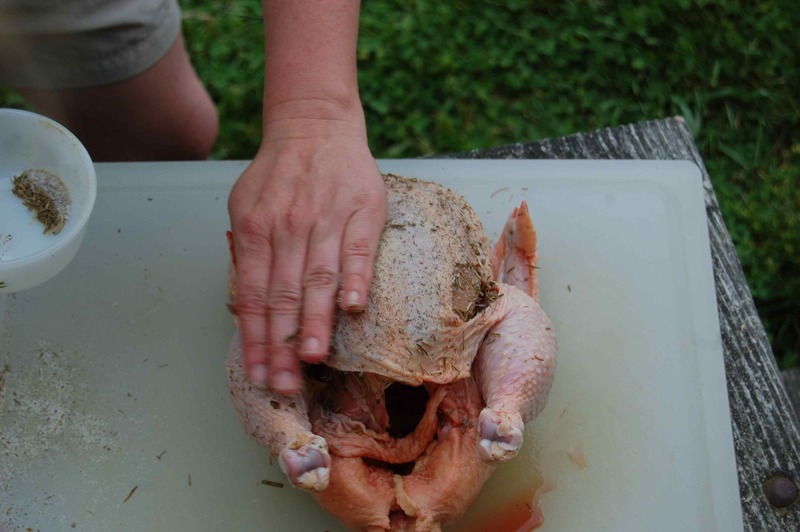 Loosen the skin of the bird and massage half the mixture directly into the meat. Squeeze the juice of the whole lemon over the surface of the bird, then sprinkle the skin with the remaining herb mix. Light one side of the grill so that the fire is at a medium temperature. You should be able to hold your hand five inches above the grate for five seconds. Scrape the grate clean with a wire brush, then wipe it down with a light coating of olive oil. 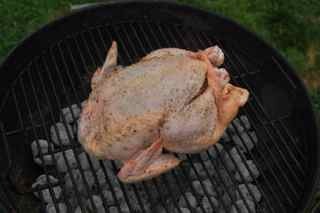 Lay the bird over the hottest part of the grill and leave the lid off. Sear the bird for no more than two minutes per side, making sure the skin doesn’t burn. Move the chicken to the cool side of the grill, the breast facing up. 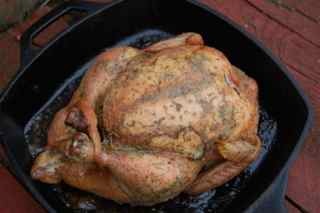 If you wish to capture the juices, set the bird in a cast-ion skillet or place a drip pan beneath it. Insert a meat thermometer into the thigh or breast, then cover the grill. Allow the meat to roast about 40-60 minutes, until the internal temperature reads 160-165 degrees. During this time be sure to monitor the temperature of the cooking chamber, adding coals or adjusting the flame as necessary to keep the temperature between 350 and 400 degrees. Allow the meat to rest 5-10 minutes before serving. Alternatively, don’t butterfly the bird. Season the meat as directed above, then arrange the flames on your grill so they run on either side of where the chicken will turn on your rotisserie. Place a drip pan underneath, cover the grill, and allow the meat to cook 1 ½ hours, keeping the cooking chamber around 350 degrees. The pictures on the right were taken by our 6-year old son as we prepared Shannon Hayes Lemon Grill-Roasted Chicken. We didn't butterfly the bird but kept it whole.